MARCH 2019 I DESIGN007 MAGAZINE 9 Further, I interviewed Geoffrey Hazelett of Polar Instruments who joked that he may be one of the more "elderly" millennials. Geof- frey explains why so many smart graduates are attracted to other fields that are considered "sexier." Then, I spoke with Altium's Andy Johnson about his work in EDA marketing, and he offered advice for young people consid- ering working in this industry. Circling back to professors, we have my conversation with Pablo Sanchez Martinez, a Spanish student studying engineering at an Austrian college who wants to become a full professor and teach PCB design. Then, we have an interview I conducted with Martijn van der Marel and Roy Arriens, students from Delft University of Technology in the Netherlands. They are members of Project MARCH, which designs and builds exoskeletons that can help paraplegics walk. We also have columns by our regular colum- nists Barry Olney, Stephen Chavez, Tim Haag, Phil Kinner, and Bob Tise and Dave Baker. Yes, the youth are making inroads into the world of PCB design and manufacturing, but we need a lot more of them. If you have any ideas about this, I'd love to hear them. See you next month! DESIGN007 Andy Shaughnessy is managing editor of Design007 Magazine. He has been covering PCB design for 18 years. He can be reached by clicking here. These young people look at us the way I looked at my grandfather when he told me about seeing his first auto- mobile and checking if there were tiny horses under the hood. They're curious, and they know that we have some knowl- edge to pass down. They know they're in demand, which gives them the freedom to say what's on their mind. I enjoy hear- ing young people say, "You're older than my dad!" Good. That means they will be around to steer their company and this industry into the future after we all retire or slip the mortal coil. 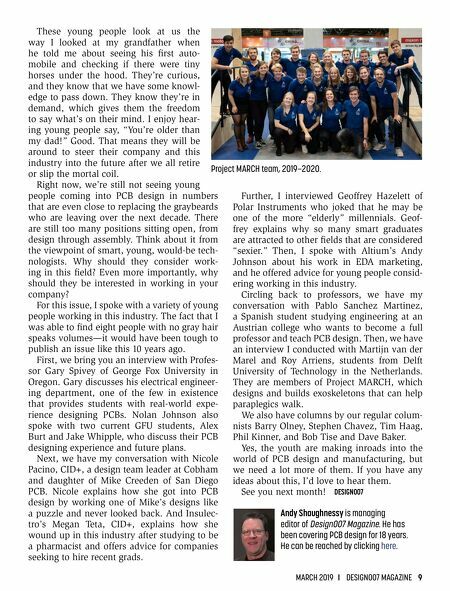 Right now, we're still not seeing young people coming into PCB design in numbers that are even close to replacing the graybeards who are leaving over the next decade. There are still too many positions sitting open, from design through assembly. Think about it from the viewpoint of smart, young, would-be tech- nologists. Why should they consider work- ing in this field? Even more importantly, why should they be interested in working in your company? 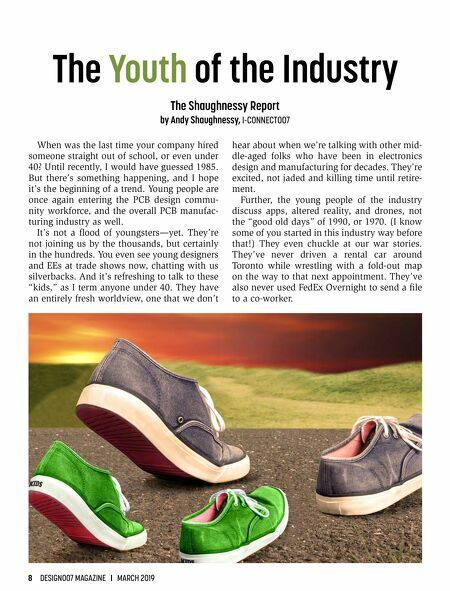 For this issue, I spoke with a variety of young people working in this industry. The fact that I was able to find eight people with no gray hair speaks volumes—it would have been tough to publish an issue like this 10 years ago. First, we bring you an interview with Profes- sor Gary Spivey of George Fox University in Oregon. Gary discusses his electrical engineer- ing department, one of the few in existence that provides students with real-world expe- rience designing PCBs. Nolan Johnson also spoke with two current GFU students, Alex Burt and Jake Whipple, who discuss their PCB designing experience and future plans. Next, we have my conversation with Nicole Pacino, CID+, a design team leader at Cobham and daughter of Mike Creeden of San Diego PCB. Nicole explains how she got into PCB design by working one of Mike's designs like a puzzle and never looked back. And Insulec- tro's Megan Teta, CID+, explains how she wound up in this industry after studying to be a pharmacist and offers advice for companies seeking to hire recent grads. Project MARCH team, 2019—2020. Column — MakeHarvard 2019: Bigger and Better!